Berlin is a city defined by its history and the physical artifacts that troubled history has left in its wake. The Wall, the Bunker, the Schloss; not only ruins from the city's past but, by their alternating presence & absence acting as imaginative dynamos, shifting portals into ideological landscapes vastly different than today's dessicated Weltanchauung. 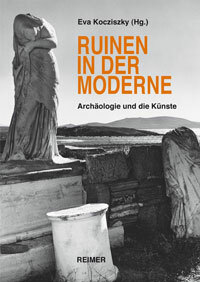 This capability of ruins - that which remains - to draw our imaginations simultaneously inward & outward is the point of departure for Eva Koczisky's collection of essays "Ruinen in der Modernen - Archäologie und die Kunst". Koczisky and her fellow authors dig at the foundations of modernity and uncover the key role which interpretations & understandings of an excavated ancient world played in the development of 19th & 20th century theories on art, culture & politics. Schliemann's discovery of Troy, Goethe's journey to Rome in 1786 & the impact of the French defeat at hands of the Prussians and its impact on Greek archaelogical practice are but a few of the strands brought together to produce a volume of essays revealing that antiquity is not as distant from us as we are wont to presume and, in fact, may indeed be unsettingly close at hand. By the end of the text we led to discover that 'Antiquity' exists, not as the crumbling structures & limbless torsos we've ceaselessly examined since their initial manufacture (Petrarch wrote of Rome's devastation during his visit in 1341), but as an ideal, continually created within our individual minds and collective cultures, essential to our sense of self and society.